Baltagi, B. H. (2005). Econometric Analysis of Panel Data, 3rd ed. New York: Wiley. Baunsgaard, T., and M. Keen. (2005). Tax revenue and (or?) trade liberalization. IMF Working Paper No.112. Berger, T. and G. Everaert. (2010). Is the Impact of Labour Taxes on Unemployment Asymmetric? Journal of Economic Dynamics and Control, 35 , 1-14. Biddle, G., and G. Hilary. (2006). Accounting quality and firm-level capital investment. The Accounting Review, 81, 963-982. Biddle, G., G. Hilary, and R. Verdi. (2009). How does financial reporting quality relate to investment efficiency? Journal of Accounting and Economics, 48, 112-131. Bonu N. S. and Pedro M. P. (2009). The impact of income tax rates (ITR) on the economic development of Botswana. Journal of Accounting and Taxation,1(1) , 008-022. Breitung, J., and M. H. Pesaran. (2005). Unit Roots and Cointegration in Panels, The Econometrics of Panel Data, 3rd ed. Kluwer Academic Publishers. Bretschger, L. (2010). Taxes, mobile capital, and economic dynamics in a globalizing world. Journal of Macroeconomics 32, 594–605. Breusch, T., and A. Pagan. (1979). A Simple Test of Heteroskedasticity and Rrandom Coefficient Variation. Econometrica 47, 1287-1294. Brumbaugh, D. L. (2006). Taxes and International Competitiveness. CRS Report for Congress , 1-6. Chen, D., J. Mintz and A. Tarasov. (2007). The High-Tax Handicap: How the World's Major Economies Shoot Themselves in the Foot with High Corporate Income Tax Rates. C.D. Howe Institute , 1-49. Engen, E. M., and J. Skinner. (1996). Taxation and Economic Growth. NationalTax Journal 49(4), 617-642. Gavin, W. T., F. E. Kydland and M. R. Pakko. (2007). Monetary policy, taxes, and the business cycle. Journal of Monetary Economics, 54 , 1587–1611. Ghinamo, M., P. M. Panteghini and F. Revelli. (2007). FDI determination and corporate tax competition in a volatile world. CESifo Working Paper No. 1965. Glomm, G., and B. Ravikumar. ( 1998). taxes government spending on education and growth. Review of Economic Dynamics 1, 306–325. Gober, J.R., and J. O. Burns. (1997). The Relationship Between Tax Structures and Economic Indicators. Journal of International Accounting, Auditing & Taxation, 6, l-24. Hakim, T. A. and I. Bujang. (2011). The Impact and Consequences of Tax Revenues’ Components on Economic Indicators: Evidence from Panel Group Data. 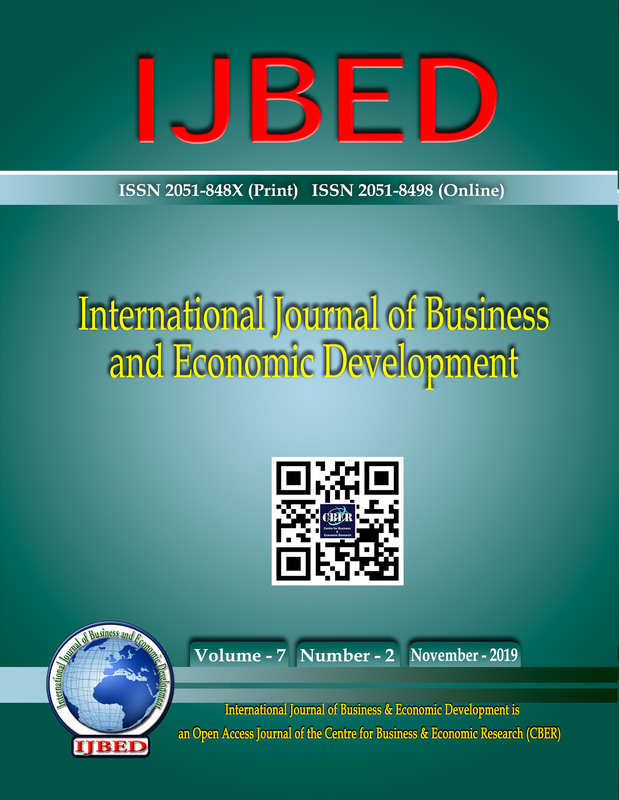 International Research Journal of Finance and Economics , 63 (3), 82-95. Hanlon, M., and S. Heitzman. (2010). A review of tax research. Journal of Accounting and Economics, 1-52. Hristu-Varsakelis, D., S. Karagianni and A. Saraidaris. (2011). Equilibrium conditions in corporate tax competition and Foreign Direct Investment flows. Economic Modelling, 28 , 13-21. Im, K. S., M. H. Pesaran and Y. Shin. (2003). Testing for Unit Roots in Heterogeneous Panels. Journal of Econometrics, 115, 53-74. Jenkins, P. G. (1989). Tax changes before tax policies, M. Gillis, ed. Tax Reform in Developing Countries, Duke University Press, Durham and London , 233-251. Koch, S. F., N. J. Schoeman, and J. J.Van Tonder (2005). Economic Growth and the Structure of Taxes in South Africa: 1960-2002. South African Journal of Economics, 73 (2), 190 – 210. Levin, A., and C. F. Lin. (1992). Unit root tests in panel data: asymptotic and finite-sample properties. UC San Diego, Working Paper, 92-123. Levin, A., and C. F. Lin. (1993). Unit root tests in panel data: asymptotic and finite-sample properties. Unpublished manuscript, University of California, San Diego. Levin, A., C. F. Lin, and J. Chu. (2002). Unit Root Tests in Panel Data: Asymptotic and Finite-Sample Properties. Journal of Econometrics. 108, 1-24. Mahdavi, S. (2008). The level and composition of tax revenue in developing countries:Evidence from unbalanced panel data. International Review of Economics and Finance 17 , 607–617. Mamatzakis, E. C. (2005). The Dynamic Responses of Growth to Tax Structure for Greece. Applied Economic Letters, 12, 177-180. Marsden, K. (1983). Links between taxes and economic growth. World Bank Staff Working Paper Number 605, The World Bank, Washington, D.C.
McNichols, M., and S. Steubben. (2008). Does earnings management affect firms' iinvestment decisions? The Accounting Review, 83, 1571–1603. Mileva, E. (2007). Using Arellano – Bond Dynamic Panel GMM Estimators in Stata. Economics Department, Fordham University , 1-10. Osbat, C. (2004). Panel unit root and panel cointegration methods. European Central Bank, 1-84. Padovano, F., and E. Galli. (2001). Tax Rates and Economic Growth in OECD Countries. Economic Inquiry 39 (1), 44-57. Padovano, F., and E. Galli. (2002). Comparing the Growth Effects of Marginal vs. Average Tax Rates and Progressivity. European Journal of Political Economy 18, 529-544. Peter, V. M., and I. A. Kerr. (2001). The Influence of Tax Mix and Tax Policy on Savings and Capital Formationin Developing: A Survey. Asia-Pacific Development Journal, 8 (1), 13-40. Saxton, J. (1997). Taxes and Long-Term Economic Growth. Joint Economic Committee, United States Congress , 1-13. Scholes, M. S., and M. A. Wolfson. (1992). Taxes and business strategy: A planning approach. Prentice-Hall, Englewood Cliffs, NJ. Slemrod, L. (2003). The Truth About Taxes and Economic Growth. Challenge, 46(1), 5-14. Stokey, N.L., and S. Rebelo. (1995). Growth effects of flat-rate taxes. Journal of Political Economy 103, 519-550. Turnovsky, S.J. (1996a). Optimal Tax, Debt, and Expenditure Policies in a Growing Economy. Journal of Public Economics, 60, 21-44. Uhlig, H., and N. Yanagawa. (1995). Increasing the capital income tax leads to faster growth. European Economic Review, 40, 1521-1540. Wanniski, J. (1978). Taxes, Revenue and “Laffer Curve”. A New Look At Taxation, 1, 3-16. World Bank. (2012). World Development Indicators. World Bank, Washington, D.C.
Zee, H. H. (1996). Empirics of Crosscountry Tax Revenue Comparisons. World Development Vol. 24, No. 10, , 1659-1671.